In the past six months or so there hasn’t been many gigs overseas that I’ve yearned to be at but this, going down in LA tonight probably sits at the top of that short list. Good friends mixed with fellow creme de la creme artists all under one roof, and I know anyone who appreciates talent and good music will be in attendance i.e. a lot my pals so I’m definitely salty that I’m so far away! 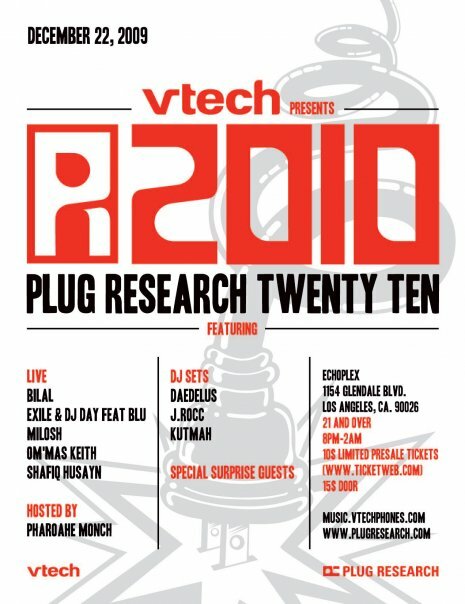 If you can get to this, get to this; new/unheard music is bound to make it’s debut at the Echoplex tonight. Go and get yourself and/or a loved one some EBA pieces right in time for Christmas. Perfect for us living in the Southern Hemisphere where summer is all about living in t-shirts. Apparently the show is set to air on Valentines Day next year.. I didn’t know Lake Bell was in this. Looking forward to [hopefully] being able to check it out online in 2010. I think Kid Cudi will be a good actor, in this kind of role at least. Above is the trailer to the A Love Supreme: U-N-I + Ro Blvd. documentary, being released in conjunction with A Love Supreme 2.0 come February 2010. As a Christmas present to all the U-N-I fans out there, Thurzday and Y-O have given out some holiday cheer in the form of a track off the upcoming re-release. Enjoy. Still buzzes/weirds me out when I happen to turn on the radio and I hear songs with Drake on them. Him, and Kid Cudi alike. First live performance by The Black Keys accompanied by the might Mos Def and Jim Jones.. hope everyone has picked up the album. Also, the video is now out to ‘Supermagic‘ (off the Grammy nominated The Ecstatic) click here to check that out.